Well, we have continued to pursue all of our paperwork, and we are happy to report that our two Social Worker visits are scheduled in order to complete the Homestudy! We will be meeting with our Social Worker on the next two Thursdays - February 17 and February 24. After we are finished with our visits, she expects to complete writing our Homestudy by the first week of March! Yippee! This is hugely important to us, because once our Homestudy is complete we can send it to the US Immigration Department (USCIS) for processing. We must request from the USCIS to bring in an Immigrant Orphan into the US. We have heard horror stories of how long it can take the Immigration Dept. to process this request, so the sooner we submit, the better. All of that is to say, we completely understand that the timing is out of our control. We are constantly reminded that God knows exactly who our little girl is, and when she will be ready for us to come get her. BUT, we are still parents, and we long with all our hearts to get her NOW! :) So we are working on our end, waiting for others to finish their parts, and trusting God minute by minute for our future and our little girl's future. And while we are working and waiting, we have been learning tons about the Chinese culture and also about the desperate conditions of many of the Chinese orphans. We have spent many hours as a family talking about life in orphanages, imagining what it must be like, and praying for those millions of girls who grow up without families. These stores have really touched a chord in Kelsey's heart. For a nine-year-old, she is incredibly sweet and sensitive, and the thought of all these girls has moved her into action . . .
One day we were driving around town talking about the orphanages when Kelsey asked, "Mom, do you think those girls ever celebrate their birthdays? Do you think they get a present or even a party?" Sadly, I answered that I imagined that they did not receive parties and presents, that those things were not essential to their living. They were treats that while we expect them, they probably don't even know about. Kelsey just could not fathom that. No presents? No gifts that were given from a heart of love? She just couldn't accept this. So, she came up with idea. Kelsey learned to knit this winter, and has already made a scarf or two. She decided that she would knit scarves for us to distribute to older orphans in China. She wants to give them a gift that is hand-made and given from the heart. But she is not going to do this alone . . . she has enlisted the help of all her little friends and then some! She called up our Youth Pastor and asked permission to make an announcement to the Jr Hi and High School Groups. And she did. She told them the plight of the millions of Chinese orphans. She explained to them that while they knit a scarf, they could be praying for the little girl who will one day receive this gift. She showed them the scarves she has knitted. And she asked them to join her! So, in two weeks we are going to have a Knitting Night at church where we teach whoever is interested in making scarves. One Jr. Higher asked what we would do if we had more than a suitcase full to take. I smiled and said we would do whatever it takes - as many scarves as we receive, we will find a way to distribute. 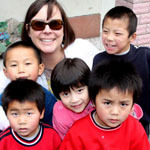 We are also finding ways for the kids to earn money so that we can take their donations to China with us and assess what the greatest need at the orphanage is. Then we will use their money to purchase those items so that they will be useful and delightful! All this from the mind of our sweet nine-year-old! Isn't God good?! Isn't He creative?! Our lives are certainly changing. Not only will we become the parents of a toddler, not only will we become a family of five - but we feel as though our entire future has changed. There is an entire country full of abandoned little girls, and we feel compelled and called by God to do something about that! Who knows what God will ask us to do besides knit scarves and bring one of those precious girls into our family?! We don't know yet what else God might ask, but He is changing our hearts daily so that we will be able and willing to say, "Yes Lord!"